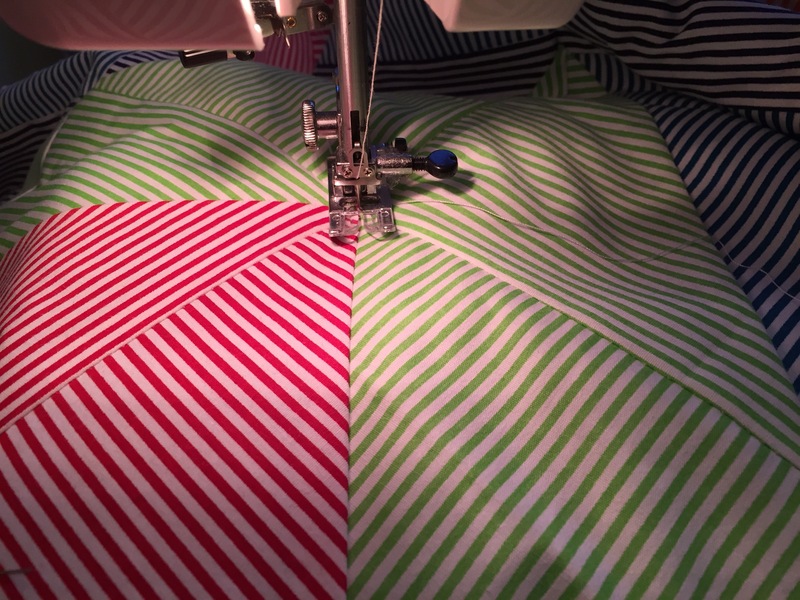 Triangles and stripy fabric – think I was being overly ambitious with this being the second quilt I have made using the machine, I’ve managed to do it though……just! A few weeks ago I was in Hobbycraft looking at their fabric bundles and saw a set of stripy fabrics which I just had to get to make a quilt with! 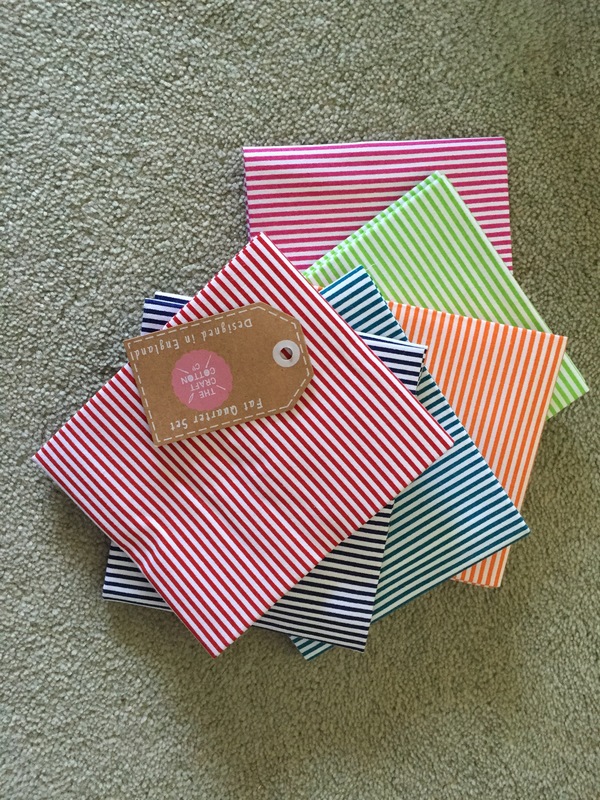 This fabric is from The Craft Cotton Company, I just love their range of fabrics! 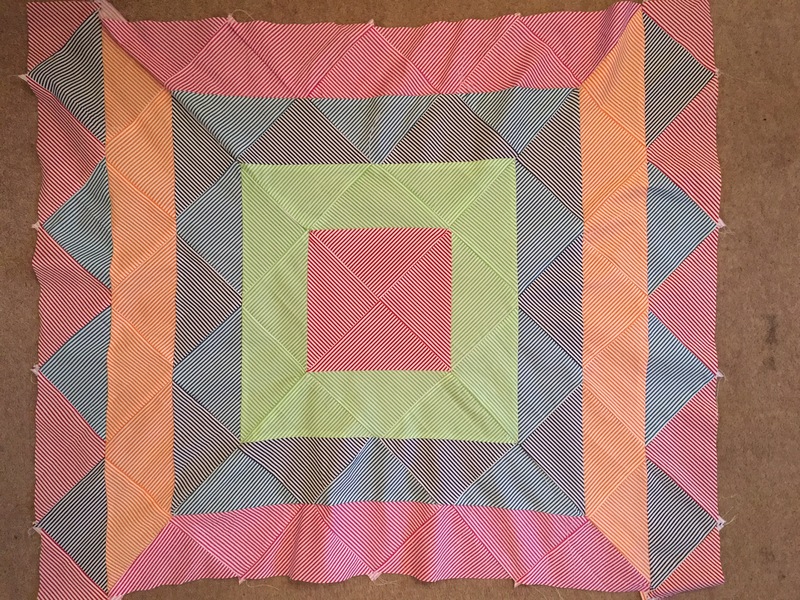 After my first successful attempt of making a quilt by machine (the houses quilt), rather than my normal method of using paper piercing I decided to undertake my second quilt with the machine. Without thinking of their complexity especially when combined with the stripy fabric I decided rather than squares to give triangles a go. I cut myself a triangle template (7inches along the base and the two sides 5inches) and got cracking with cutting out all the fabric, however as I had decided to not match up the stripes on each of the triangles but to have them going in different directions it made the cutting out a bit of a mission. 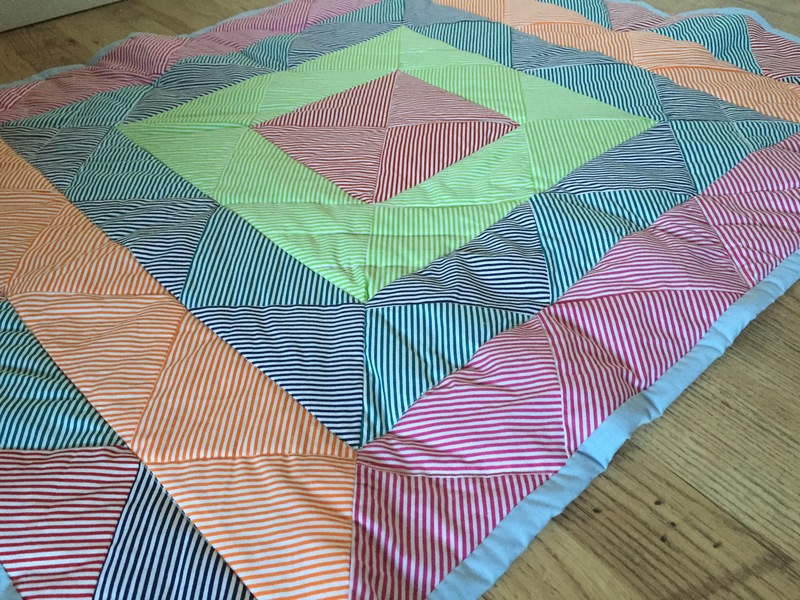 The amount of times I cut the triangle out wrongly was just ridiculous, despite taking the time to get the template laid out correctly and being convinced it was going to be right! Luckily I finally managed to finally get the hang of it but it took a lot longer to cut out than I thought! At least I got there eventually – without driving myself too crazy, well maybe just a little bit! Although I think I need to invest in a rotary cutter to make the cutting out easier, was not easy with the scissors! 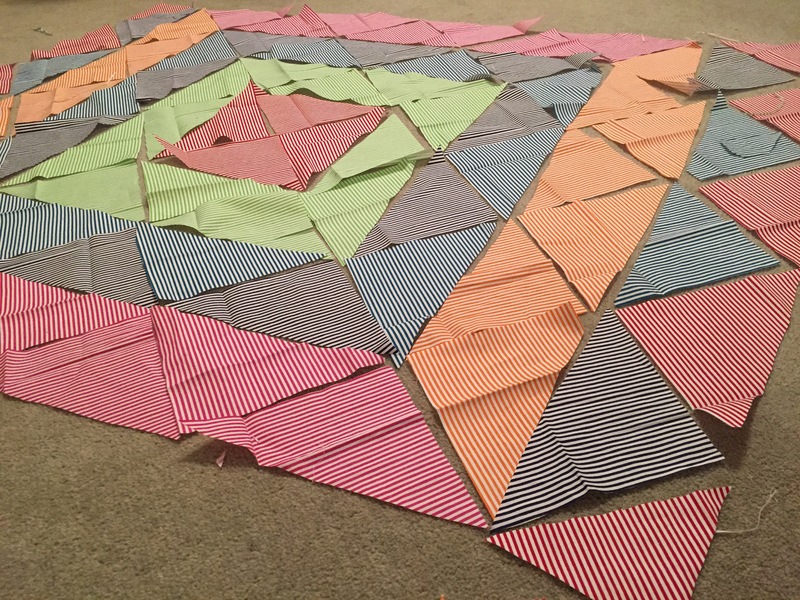 Luckily I had just enough fabric for the triangles, and when I say just I really mean it – there was only a few scraps of fabric left! Next came the next problem with my bright idea of using triangles – sewing them all together. To sew them together I placed two of the triangles right sides together and sewed down the edge about 5mm from the edge and then opened them out, and repeated the process. 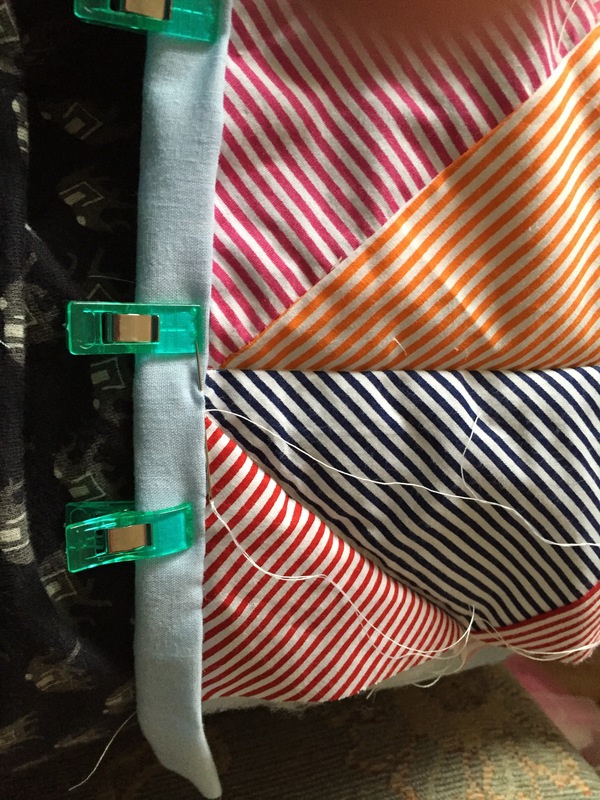 I started with the red middle section, then completed each side row then attached the row to the red middle section then sewed together the corners, using the same process of placing the fabric right sides together and sewing down the seam. 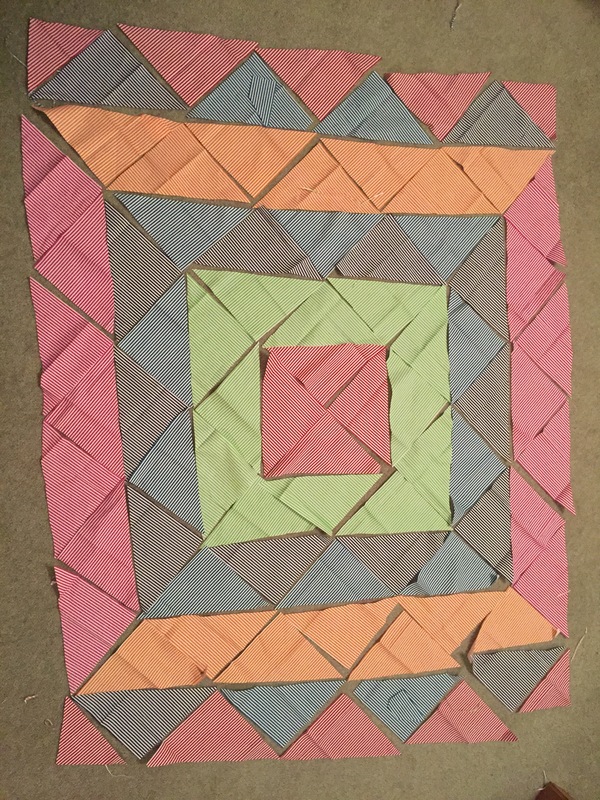 This was then repeated for each following row of triangles and sewing them to the previous row. As I have only used paper peirceing before I haven’t encountered any problems of slightly mis-aligning the triangle edges slightly, since when you are sewing the pieces together the paper template keeps the fabric the right size and it’s easy to put it and keep it in its correct alignment for sewing. I found a few times that somehow despite taking time to line everything up and pinning like mad I still managed to machine sew them slightly off alignment and had to unpick and red-do quite a few before getting the right positioning, and I’m still not sure I have got them all together 100% correctly! But looking at these lines for too long makes your eyes go a bit crazy so I think they are all ok! 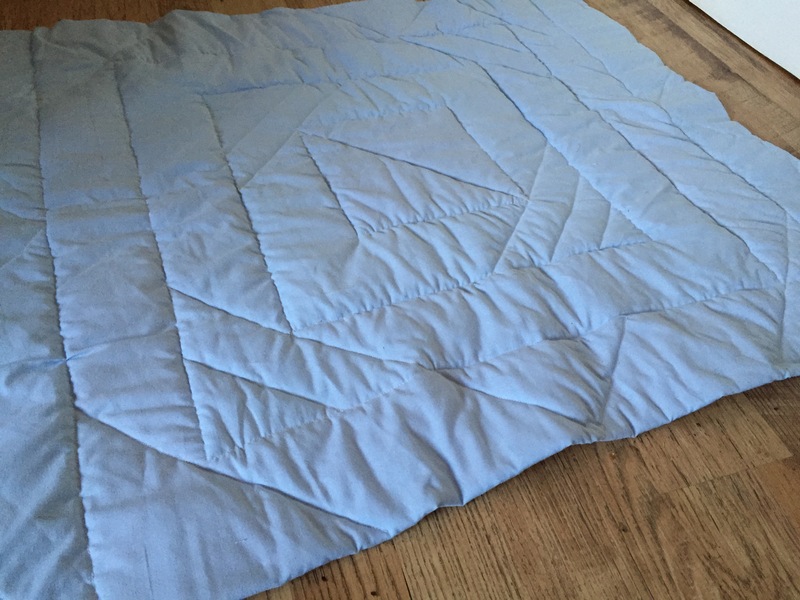 Next I quilted the front section with the batting and backing sheet, for this I used a nice light blue fabric. I didn’t want to use a patterned fabric as I thought it would be too much with the stripes on the front. For the quilting I went around in 4 large squares down the seams between the two fabric colours, and then did some extra detailing in the corners of these squares and at the edges of the quilt on the diagonal. For the edge binding I folded the edges of the backing sheet around to the front and back under themselves like a hem, and slip stitched around the edges. I really like using this method and find I can do it without too many problems! Does take me a little while though, but I think that’s just because I’m wary of messing it up at this late stage! 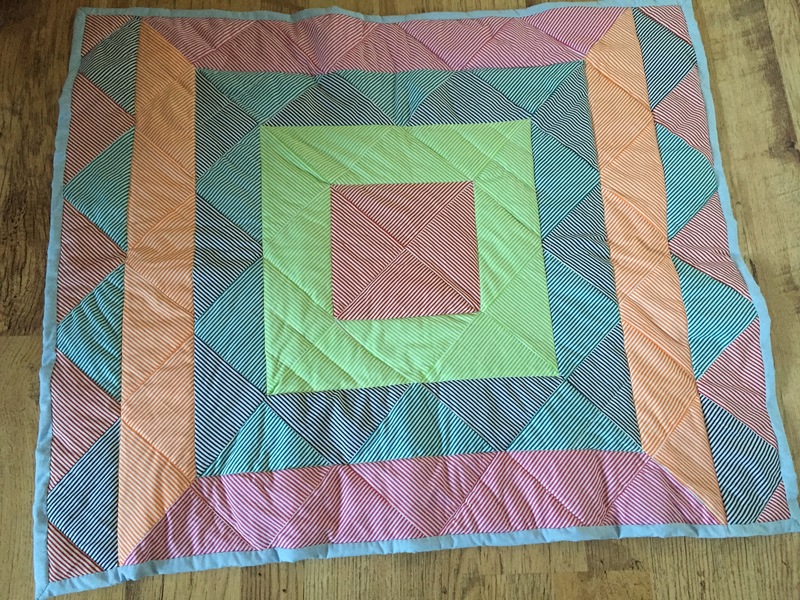 I really like this quilt, despite a few problems with the triangle alignment it’s come out great considering it’s only my second attempt at skin a whole quilt using the machine. 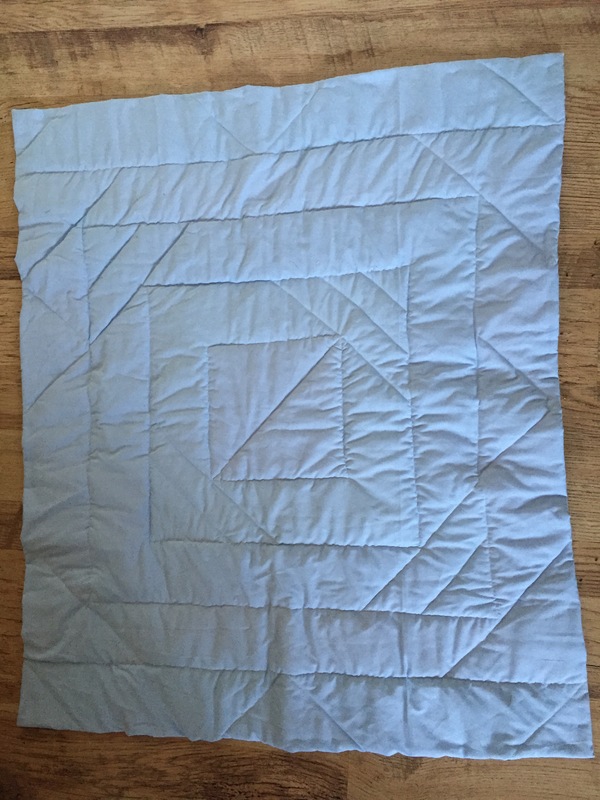 Also without running into problems you would never learn how to get out of them so it’s all helped me on my long road of learning machine quilting! Maybe I should stick to plain fabrics for now! 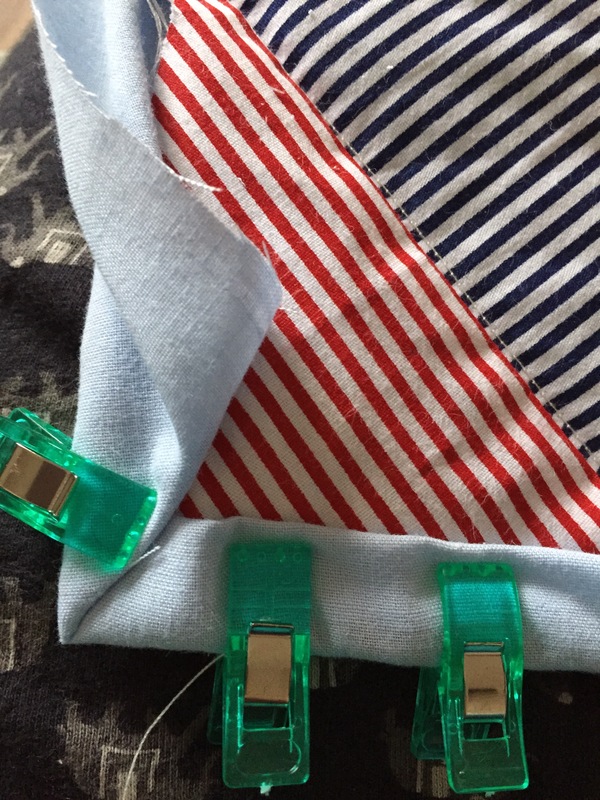 For some more great ideas using the Craft Cotton Company fabric check out their blog, you will find this tutorial of mine along with a lot more other great tutorials. < Crochet tooth shaped tooth holder pattern – Perfect for keeping a tooth safe ready for the tooth fairies visit, much easier for her to find where it is too!